I finally received my business cards today. And, while my job title says "Director of Brand Management", it should really read: "Manager of Chaos Supreme, Evaluator of Multiple Time Zones, Distributor of Limited Knowledge & Interpreter of Many Cultures". But, there just wasn't enough room on the card . . . and, after this week, I should add: "Senior Pooper Scooper". We Need A Return to Values . . . Yesterday, our 44th President was sworn into office. 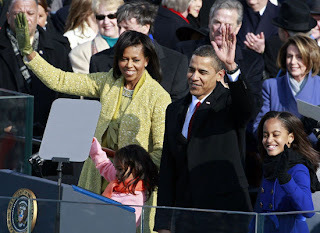 I swelled with joy at the historic moment that Barack Obama took the sacred oath to defend our constitution and to uphold the individual liberties of our citizens as our country's first African-American Commander-in-Chief. I was especially touched by the declaration that we must return to wholesome values, that we must be humble in our approach among allies, and that we must be vigilant in defending ourselves against our enemies. I was brought to tears as I listened to his words and wanted so much to believe in my heart that today may truly be "a new day"--a day for us to all put away our selfish ways and to come together for the advancement of the good of mankind and not for our own wants. I was appalled and embarrassed, however, that those who would claim to be his followers stooped so low as to "boo" President Bush as he entered the inaugural platform. Bad form my fellow citizens! You should be ashamed! I urge you to heed Obama's words and to return to the values of teamwork, neighborly love, forgiveness, honesty, and kindness. I Work Hard So You Don't Have To . . .
Well, I finally had it out with Miss Ashley in 3C last night. I had an itching that her newly somber comings and goings would likely not continue long term. She really topped herself Sunday night when she broke into a shouting match with her houseguest, Liz. And, how do I know that her houseguest's name is Liz? Because I heard the entire dialogue through my wall at 1:30 am, of course! Apparently, the f***'n houseguest didn't let the f***'n dog out when it needed to go to the f***'n bathroom and it pee'd all over the f***'n couch that costs $1000 f***'n dollars! Luckily, I was off work Monday for the MLK holiday, so I was still awake at 1:30 am reading my book; I tried my best to ignore them . . . Unfortunately, Miss Ashley found herself locked out of her apartment last night when she tried to leave to run to the store at 10:30pm. I lay in bed listening intently as she shouted to Liz inside the apartment to let her in. The door knob was jammed and neither one could open the door. I then listened as she called a locksmith to come rescue her. Twenty minutes later, the locksmith arrived and I listened as he explained to her that he would only be able to gain access to her apartment if he drilled the lock for a hefty handover of $250. Somewhat upset at having to fork over such a large sum of money, she rang my doorbell! Why did she ring my doorbell, you ask? Well, Miss Ashley and I share a balcony you see. Both our apartments have a sliding glass door that leads out to a balcony that we share with a half wall. And, after listening to her conversation with the locksmith, I knew immediately what she wanted--to walk through my apartment to gain access to hers. I answered the door (in my pajamas--which seems to always be my attire of choice whenever she and I interact with one another) and said, "Oh gee, what now?" "OK, Ashley, I am happy to let you walk through my apartment, but can you give me one reason why I should?" "I mean, you need my help. Why should I help you right now when I have asked you repeatedly to be quiet and help me get a good night's sleep and you have refused to be more quiet?" "I am NOT having this conversation right now." (eyes rolling) "I am not too loud. The guy below me is so loud that he makes my apartment vibrate. . . "
"You have got to realize that you live in an apartment--an apartment in the city. The building is old and it's going to be noisy. I can't help it if the walls are paper thin." "The walls are not paper thin. You are that loud. ", I said matter-of-factly. After a few deep breaths and another eye roll, she responded, "Well, tell me this. How is it that I never hear you and you claim to hear me all the time." "Because, Ashley, I have lived in apartments long enough to understand that it is a communal living situation and that I need to be quiet for my neighbors' sake." "That's not what I am saying at all. I am simply asking that you be cognizant of those around you. I am not being unreasonable in my requests to not wear your shoes on the floors and to not slam doors." "And, you could keep the shouting to a minimum as well." She stared incredulously at me. "That's right. I can hear you! I heard your entire conversation last night at 1 in the morning! And, I just don't need to hear the f-bomb thrown around, especially at 1 in the morning!" "Whatever! Are we going to do this or what? ", she asked while neglecting to actually make the request formal. "Again, I am happy to help you. I just think that you need to be more willing to help me with what I need." I let her through and immediately went back to bed. No, I didn't receive a "thank you" and she didn't even come close to understanding what I was asking. I then lay in bed and listened to her complain through the wall for an hour about how "she is NOT too loud." Yeah, I have to move once my lease is up in May. A flight leaving LaGuardia airport this afternoon failed directly after take-off and landed in the Hudson River. We saw the plane go down from the Nickelodeon offices and were frightened for all the passengers on board. At first we couldn't quite tell what type of plane it was or how many people might be on board, but we were glad that the plane had fortunately drifted on the surface of the water without breaking apart, or worse, exploding. The plane appeared to float for some time without completely becoming submerged, which allowed the Coast Guard to immediately rescue everyone. My first thought was, "I can't imagine how cold they are in that water out there." We had a sudden arctic cold front hit us Tuesday night, leaving us with record breaking cold temperatures. The temperature was only 20 degrees when the plane crashed; I can't imagine how freezing the water was under those conditions . . . I am so glad that everyone is alive. I was running late for work today, but thankfully the Gods were looking down on me this morning. I managed to perfectly time the arrival of the M86 bus, the 4 Express train, and finally, the S train on my way to Times Square, allowing me to arrive just 3 minutes before my 10am Strategy meeting this morning. And, although I was in a hurry to get to the office, I wasn't in too much of a hurry to see ABC World News Reporter Bob Woodruff sitting next to me on the S train this morning. He was catching up on his own personal news source: The New York Times. I've Been Catching my ZZZs . . . I've managed to get a full 8 hours of sleep every night since returning to The City. I guess a little retaliation goes a long way . . . Miss Ashley in 3C has been on her best behavior, coming and going quietly at normal hours of the day. I just hope this trend continues to become a habit instead of flickering out like a fad . . . Unfortunately, it also means I haven't had the chance to try out that nifty noise machine Stacey gave me for Christmas yet! 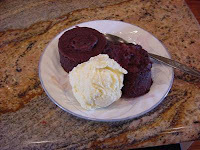 I received this recipe from my aunt and immediately tried it. It was the perfect companion for an evening of Twilight saga reading and took care of that chocolate fix in minutes! 1. 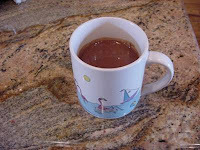 In a large coffee mug, mix the flour, sugar, cocoa, baking powder and salt. 3. Add oil, milk, and vanilla extract and mix well. 4. 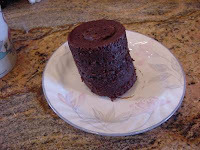 Bake in microwave on High (1000 watts) for 3 minutes. 5. 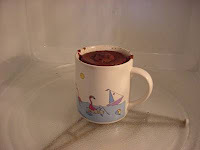 Allow to cool a little and remove from the mug for serving. * For a healthier alternative, replace the sugar with Splenda and replace the oil with applesauce. After hearing all the fuss about Twilight, I finally decided to crack open the book and give it a chance. Halfway through Chapter 3, I was hooked. I managed to read all but the last 60 pages on my flight home yesterday, slowly falling in love with Edward's charming and gentlemanly ways. Kristen Stewart (Bella) has got to be one of the worst actresses I have ever witnessed. Kristen Stewart and Rob Pattinson (Edward) have absolutely no on-screen chemistry. The director managed to over-cheesify the few romantic scenes that actually appear in the movie. The movie almost completely ignores the intrinsic draw of the book, which is Edward and Bella's long, heartfelt conversations. But, I have to admit that Rob Pattinson nearly nailed Edward's emotional dichotomy on-screen; plus, he's really hot! On the way home, I stopped at Barnes & Noble and picked up New Moon, the next book in the saga . . . yeah, I am really pathetic.